Specifically designed for people in the medical field of chiropractic care, the Chiropractors Disability Insurance Plan recognizes the coverage needs of people in this specialized occupation. Traditional insurance markets often leave highly compensated Chiropractors without adequate disability insurance. Sufficient DI coverage is one of the most important pieces of a secure financial plan. A disability resulting in the inability to return to work could cause financial ruin; being underinsured is almost as dangerous as having no insurance. The Chiropractors Disability Insurance Plan allows Chiropractors to continue living comfortably in case a disability leaves them unable to work. With issue limits as high as $100,000 per month and participation limits up to 75% for personal disability and 100% for business uses, our Chiropractors Disability Insurance Plan will offer proper income protection for your clients. Tony H., D.C. just out of chiropractic school and has the opportunity to purchase an existing Chiropractic practice. He borrows $500,000 from the bank to make this purchase and the bank demands disability insurance to indemnify the repayment of the loan. Business Overhead Expense is limited to a 24 month benefit period which does not cover the entire period of the loan payback. The answer is Loan Indemnification from PIU! 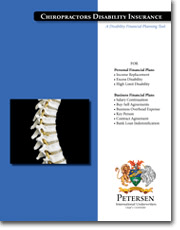 Petersen International Underwriters designed the Chiropractors Disability Insurance Plan to provide men and women working in this medical field with the proper amounts of coverage they require. In the event of an accident or debilitating disease, PIU’s Chiropractors Disability Insurance plan will keep your clients safe. PIU is here with all the information you need. We will help you expertly explain disability plan options to your clients and get them covered adequately.